Today I'm posting as part of a one time blog hop. Thanks to my friend Ginny Duncan at Stamping with Ginny for nominating me. Ginny is a friend and fellow Demonstrator on the "Canada Inks Up" Team and I love her design. Check out Ginny's amazing creations! I was really excited to participate in this blog hop when Ginny asked me - it is a one time post, answer a few questions and then nominate others. What a great way to be part of a great group of stampers and also to share some of their creations with you. Take some time to follow the postings that are part of this blog hop. Today I'm sharing a couple of cards that use the "A Happy Thing" stamp set from the Sale-a-Bration catalogue. I loved this stamp set when I first saw it and knew it would be one that I would have to earn. During Sale-a-Bration, you earn a free product from the Sale-A-Bration catalogue for every $60 (I'm in Canada) you spend. This stamp set is perfect for use with Blendabilities. I pulled out this set a few weeks ago to make a card and found out that my favourite colours for the Blendabilities is Daffodil Delight. I started to colour and the lightest shade was dry - it must have been the swap cards that I made for Convention last year. My new set arrived and I'm all set to share the cards with you. Here's an easy card using the stampset and also an easy image to learn to blend using our alcohol markers. I'm not sure there is a right and wrong way to do the blending. I always start by colouring the entire image with the lightest of the 3 shades. Once that is done I lay down the darkest shade in an area when I want to do some blending. Can you see the blending on the lemon? Then I come back with the lightest shade and blend over that image until there is no line of the darkest shade. For this card I added a second line of the medium shade and again blended that with the light shade. The markers are easy to use which makes them perfect to get some stunning coloured images for your cards. Daffodil Delight CS - 5 1/2" x 8 1/2"
Typeset DSP - 4" x 5 1/4"
Fold the Daffodil Delight base in half using a bone folder. Adhere the Typeset DSP to the base (make sure that you have the words on this DSP going in the right direction). Adhere the Daffodil Delight CS to the larger piece of Mossy Meadow CS. Adhere this piece at an angle to the card base. 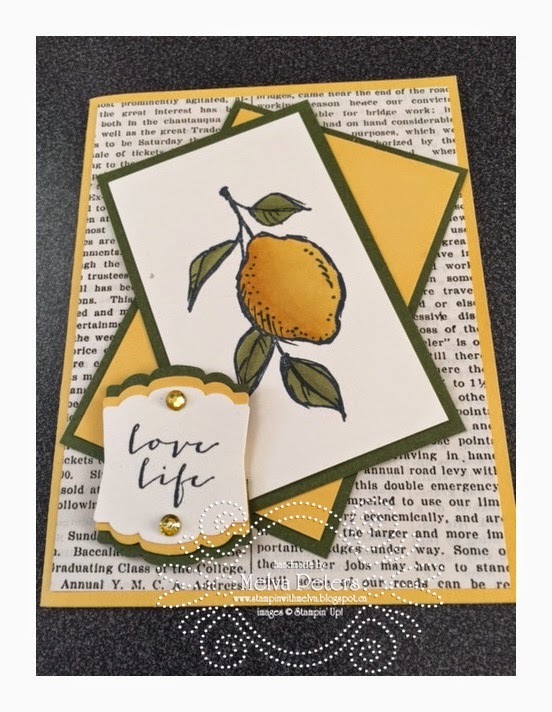 Stamp the lemon image on the Very Vanilla CS and colour with the Daffodil Delight Blendabilities. Make sure that you colour on a piece of paper - the colour will bleed through the CS - I was told if it doesn't, you're not doing it right! Adhere this piece to the smaller piece of Mossy Meadow CS and adhere that piece to the card base on the opposite angle. Stamp the sentiment in Memento Tuxedo Black and punch out using the Artisan Punch. 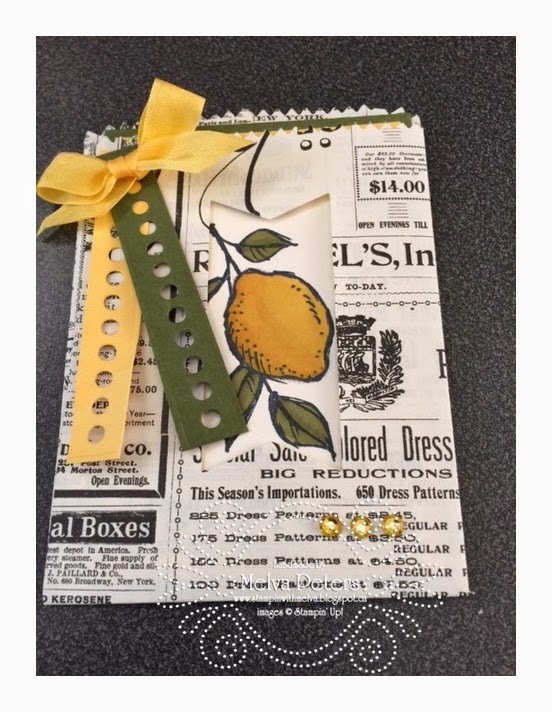 Punch 2 additional pieces in Daffodil Delight and Mossy Meadow. Cut these coloured pieces in half and adhere to the back of the sentiment - I adhered to the top and bottom but you could also adhere on the sides. Add 2 rhinestones that you have coloured with the darkest shade of the Daffodil Delight Blendabilities. The next card uses the same stamp set and the Mini Treat Bag Thinlits Die. You can use the Treat Bag to put your card in. I used the same colours on this card. For the treat bag, I cut out the pennant flag (comes with the set of dies) in the centre of the bag so that the image shows through. To embellish I used 2 pieces cut out using the circle strips (also comes with the set of dies) and a piece of Daffodil Delight Seam Binding for a ribbon. As part of the Creative Blog Hop, I was asked to answer 4 questions about myself. I have a few projects underway. I'm working on some cards for a swap I participate in. The theme is Spring or Easter. I love the Indescribable Gift stamp set and of course Blendabilities. I also love doing Mixed Media so I've got a Mixed Media Journal underway and am planning a Mixed Media class for March 22nd. I received my Paper Pumpkin kit for February so have that underway as well. How does your work from others in your genre? This is a hard question. I don't really see my style as being different. I'm sure that others might be able to describe my style, but I really can't. I get inspiration from many places - other people cards, fabric, all over. I tend to use a lot of layers and while I sometimes think my cards are simple, they probably are a little bit fussy! Why do you create like you do? I've been making cards for about 20 years but have been "crafting" for much longer than that. I've never considered myself artistic but more "crafty" and I've tried lots of different crafts. Paper crafting is the one art that I enjoy the most and have spent the most time at. I love the feel and look of paper and these days every craft I try has an element of paper crafting in it. I've been doing Mixed Media recently and am really enjoying exploring my artistic side and have been surprising myself. I love taking the time for myself that crafting allows - no matter what I do it's time I spend doing what I love and sharing with others. How does your creativity work? I often get ideas from things I see but I'm also often inspired by other peoples' cards and projects. I saw a lady wearing a blouse one day in a line up and knew that I could re-create the look of the fabric. Sometimes I see cards and projects I try to re-create or CASE or to change it up and make it my own. That might mean changing the colours to some of my favourites - these days that often includes Blackberry Bliss and Hello Honey! 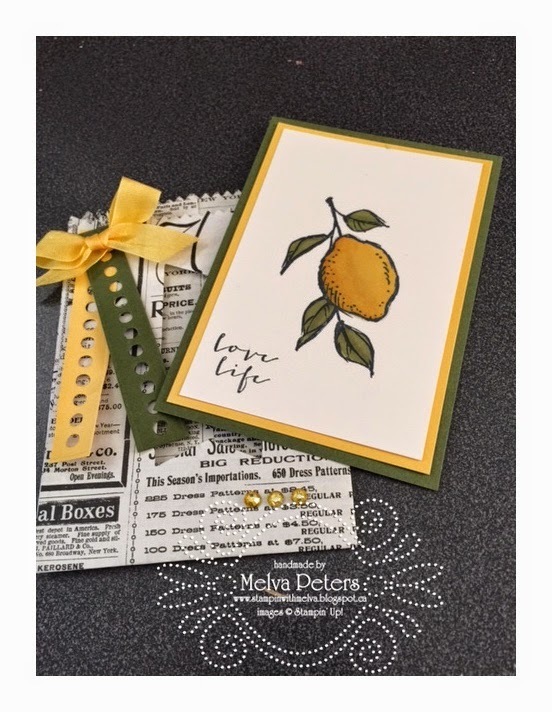 Now it's my turn to nominate another talented stamper for the Creative Blog Hop - Amber Meulenbelt at Stamp With Amber who will post on Monday March 2nd. Check out her amazing designs and projects!